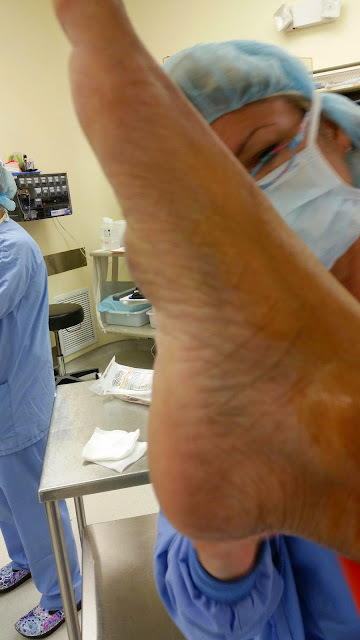 Plantar Fibroma treated with conservative care at first at our center without avail. Initial treatment consists of topical gel of Verapamil 15% gel and other topical compounds to help relieve the pressure and pain in an attempt to reduce the size but was to no avail. Typical protocol is 3 x a day application up to 9 months even. She was not able to continue conservative care due to pain with every step. No true answer to this. Theories have involved: microtrauma, genetic predisposition, that causes the body to form extra fibrous tissue. 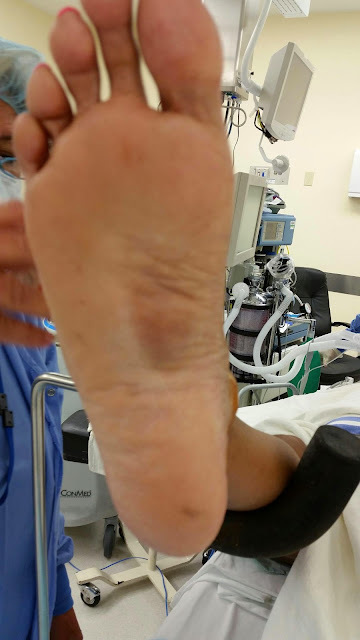 Where are the fibroma commonly located in the foot? Typically the medial to central band of the plantar fascia. Medial being the side towards your big toe and central being around the 2nd and 3rd to region. The photos below is a classic example of the fibroma in the medial and central bands. What are the chance of regrowth and is surgery successful? Fibromas have a high recurrence rate, up to 80% in some papers. Recommendation is usually to only remove such only if symptomatic. Symptoms can occur with even very small fibromas, some patients with even huge fibromas do not hurt. From experience the patients that complain about pain are those that have the fibroma growing right over a nerve, often an inflammed nerve is found under this fibroma. The best case scenario is no regrowth or recurrence but next best out come is that if the fibroma regrows it forms in a different area that does not compress on the nerve. What steps can my doctor take to improve success? Papers have stated up to a 1.5 cm margin of regular tissue to be taken out in addition to the fibroma itself to reduce the chances of recurrence. I have them on my hands and my feet is that normal? Some people do have it in both areas but not always. A hand surgeon or plastic surgeon will help address the hand lesions. You have the same band of tissue called the aponeurosis in the hand as well as the foot. If you or loved ones have this condition call us at 239 430 3668 option 2 to schedule an appt! due to rubbing of the fibroma in her shoes.